Our friends: So, Todd, what did you do for your 40th birthday? Todd: I pushed the world apart. This day was the reason why we decided to come to Iceland during the cold of winter and when the country has shortest daylight of the year. On this day, Todd turned 40. 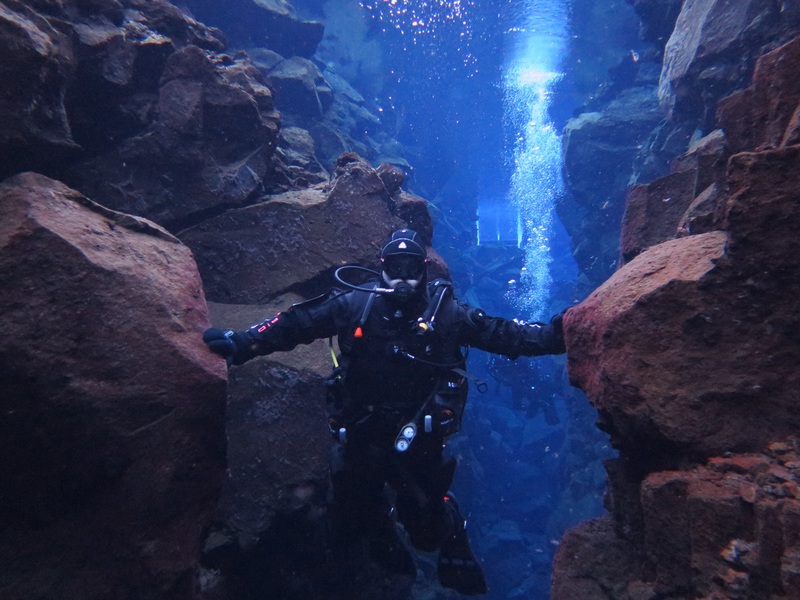 He wanted to spend his 40th birthday diving the Silfra Fissure. 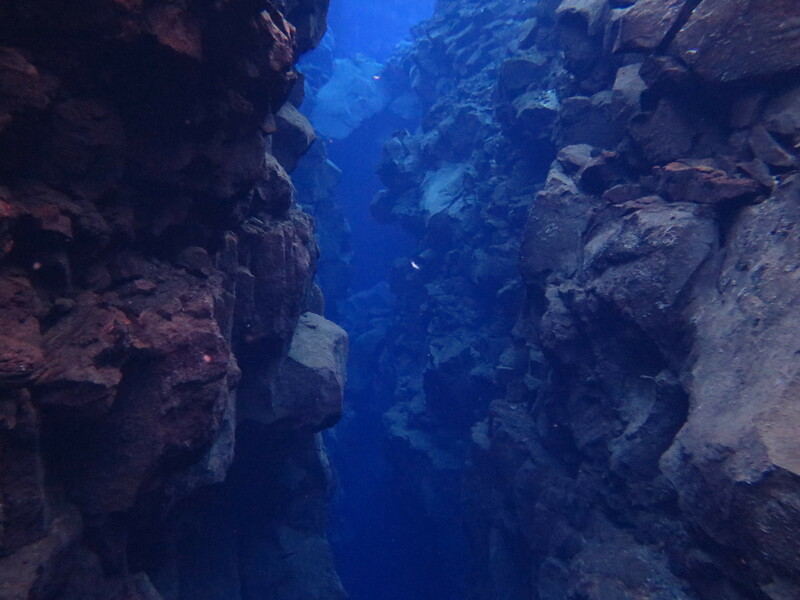 Silfra is where the North American tectonic plate and the Eurasian tectonic plates meet. Every year, on average, the crack widens by an inch, and then immediately fills with lava. 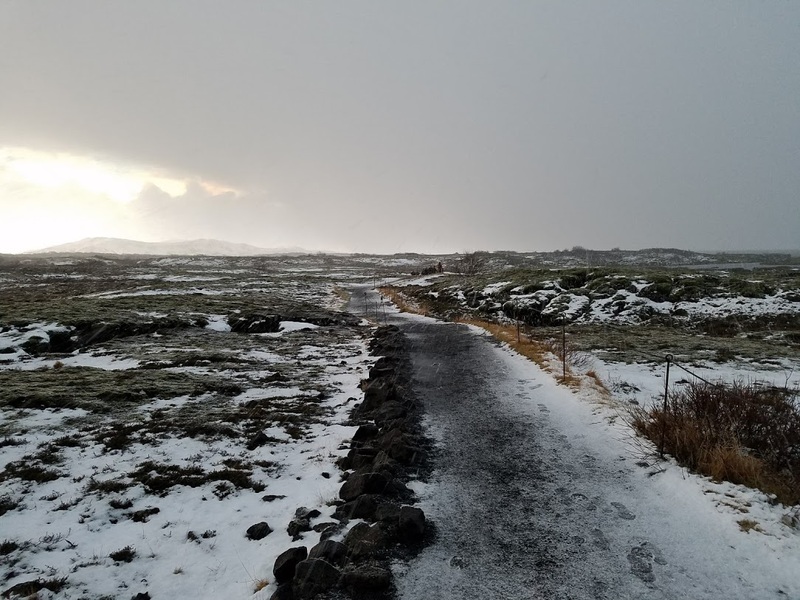 As one of our tour guides hilariously put it, “Iceland is growing an inch per year. Slowly but surely we will take over the world.” It’s literally a crack in the earth that is filled with glacier fed fresh water. The water comes from a glacier that is 20 miles away. 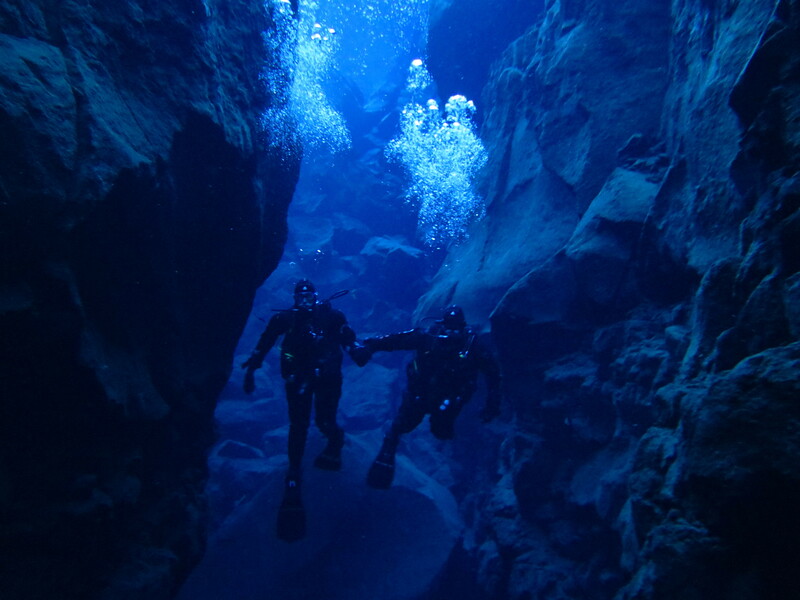 It takes 40-70 years for the water to travel to Silfra from its source, through 20 miles of lava rocks. The result is crystal clear water without any sediment in it. The water remains 32-34 degrees Fahrenheit year round. And it is delicious. I trained to do this dive with Todd. 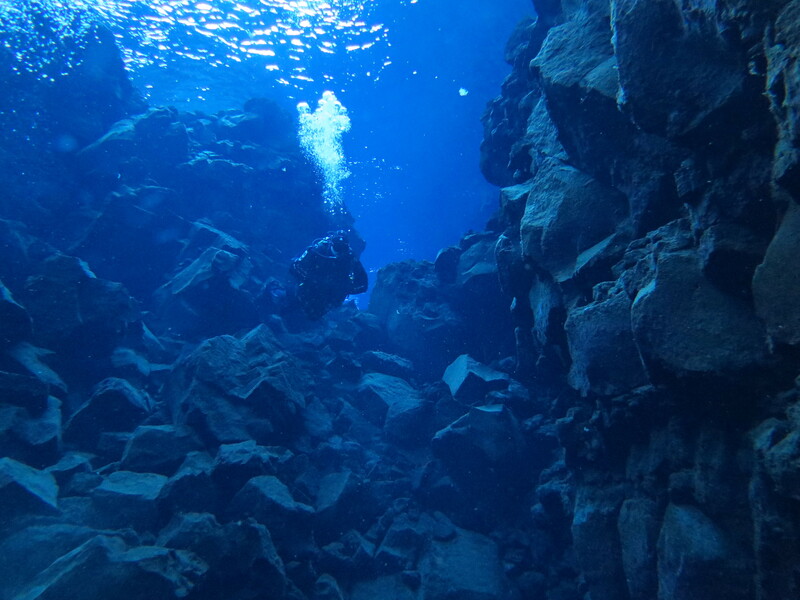 Silfra is not the kind of place that you just jump in and swim along. It is way too cold for that, see above, 32-34 degrees. I cannot stress enough just how cold this water is when you’re submerged in it. Without the proper equipment, these are instant hypothermia conditions. I purchased a brand new dry suit that had a thermal liner in it. I went out and bought merino wool long johns and fleecy pants to wear over that. Todd is a scuba instructor and he trained me on my dry suit. We did a pool session and then an ocean session before leaving for the trip. The ocean training session before we left was a hard hitting brutal reality for me. The water in Rhode Island was 52 degrees. 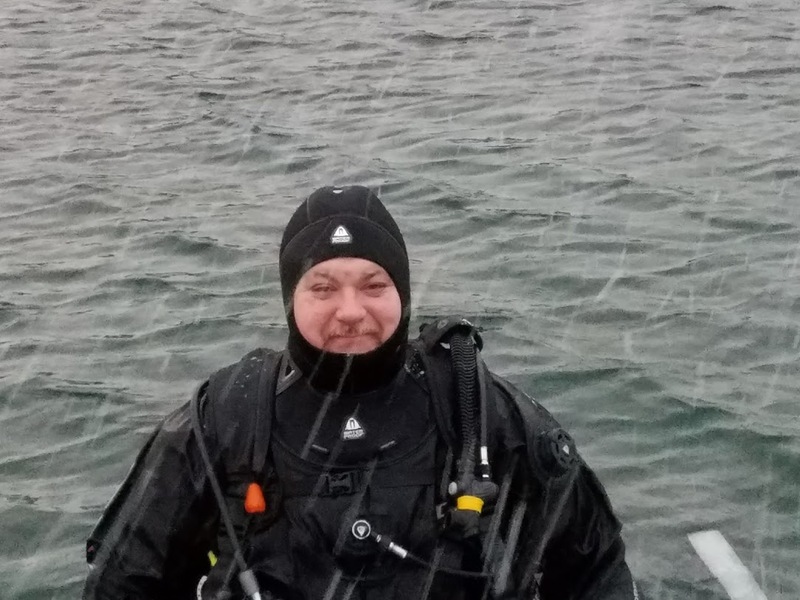 While the dry suit kept me mostly warm, my hands and head are still exposed to the water. Sure, I was wearing a neoprene hood that is 1 cm thick, and neoprene gloves that are 5 mm thick. But I got a very painful brain freeze when I entered the water that day. I never have experienced a migraine, but I imagine it feels like this. 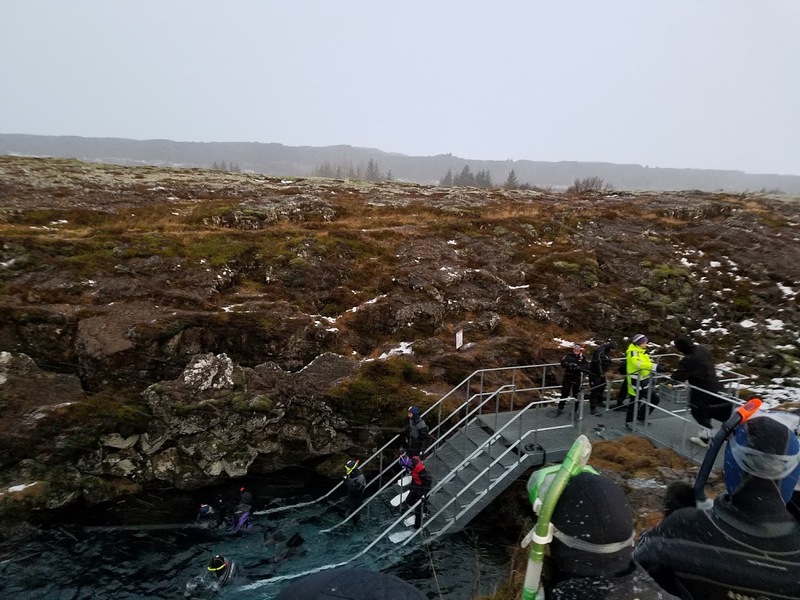 When I got out of the water after the training dive I seriously doubted my ability to dive at Silfra, where the water would literally be 20 degrees colder than that. We arrived at the dive site and I geared up. I donned my suit, instead of wearing my undergarments, I borrowed one from the shop. I trudged up the path to the entry point. I was wearing my merino wool long johns, the thermal suit from the dive shop, two pairs of socks. Todd went in first, then I went down the stairs and entered after him after the guides helped me to put on my mask and fins. I couldn’t put them on myself, as I was already wearing my three finger gloves. Picture jamming your hands inside oven mitts and then trying to do anything that requires dexterity. Not gonna happen. I stepped into the water. I noticed my left foot quickly got much colder than my right. I thought “That’s interesting. Left foot cold, right foot warm.” I stepped down two more steps on the stairs. OK, left foot is definitely wet. “My suit is leaking,” I blurted out. Todd suggested I was just feeling cold. “No, really, I know what wet feels like. There is water sloshing around in my left boot.” The guide knelt down and checked. Sure enough, my suit had a puncture in it the size of a dime. My suit was filling with ice cold water. I told Todd to go on the dive without me, which I hated to do, but I wasn’t interested in freezing to death by having my suit slowly fill with water. I aborted the dive, and walked back to the parking lot, feeling the ice cold water slosh in my left boot. I was relieved to learn that they had brought an extra suit for me. I went over to the bench near the parking lot and removed my suit. Sure enough, my foot and leg were drenched up to the knee. I had only packed two pairs of socks, and I was already wearing both pairs. A thin merino wool pair, and then a thicker fleecier pair over them. I scoured our things for more socks. None. Time to go all MacGuyer, there was no way in hell I was going to miss this dive. I considered cutting up my fleece shirt and fashioning socks out of the sleeves. Instead I grabbed Todd’s spare hat and one of his gloves. I put on a dry thermal undergarment, which actually fit better than the first one, and then I took one sock off of my dry right foot and put it onto my left foot. I wrapped my left foot in the hat, and jammed his glove on my right foot. It only covered half my foot, but I reasoned that the toes were the important part—keep the extremities covered. I pulled on the dry suit, and then made my way to the exit, where Todd was coming out. I managed to snap some pictures of him that we would not have otherwise gotten. He had a smile plastered to his face, telling me it was the best dive of his career. The water was crystal clear, the rock formations fascinating, and he was literally able to touch the North American plate with his right hand and the Eurasian one with his left. He had been dreading the walk back to the parking lot from the exit point. 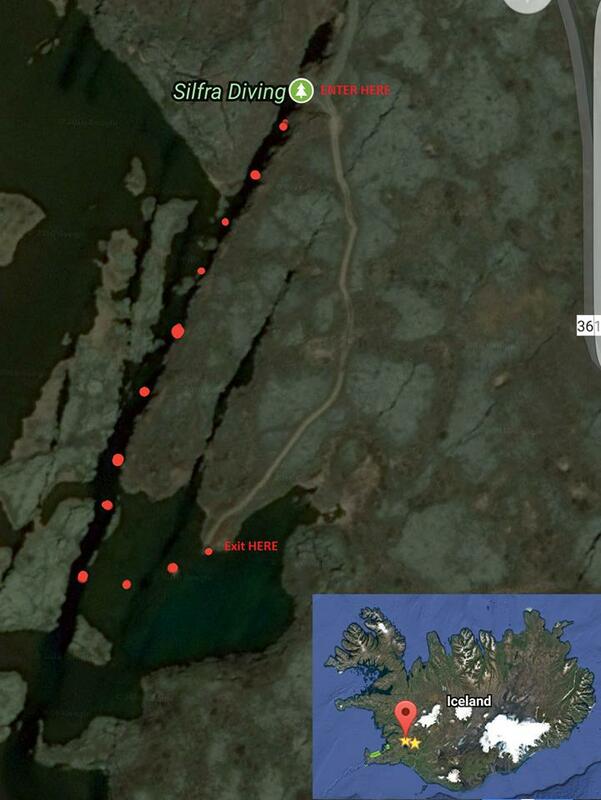 It was probably a quarter of a mile, maybe a bit longer, carrying dive gear in the cold Iceland wind. I walked with him, and listened to him tell me all about the dive. My stomach clenched, I knew the cold would be very challenging for me. 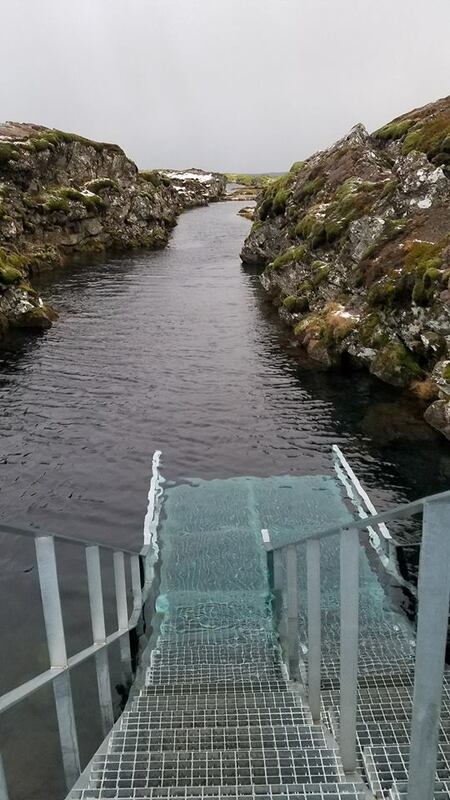 This is how you enter the water at Silfra. North America is on the right, Eurasia on the left. Todd made this map of the dive. The thing that is dicey about doing a second dive at Silfra is that the equipment has a chance to freeze. When you are breathing off of a regulator, your breath condenses on the metal parts inside the regulator. The condensation may freeze, thus rendering the regulator unusable until it has the chance to thaw. It is far too risky to try to breathe off a regulator that is frozen open or frozen shut. We got back and geared up for his second dive and my first. The guides checked to make sure the regulators hadn’t frozen. One had, not mine or Todd’s, and the guides had to swap them out. I entered the water first, and my teeth immediately started to chatter. Our guide checked my weight, to make sure I was wearing enough to be able to sink with all my equipment on. Then we descended. The cold rushed to my head, and tried to penetrate my three fingered gloves. I felt the same thing I had felt a few weeks ago when we did my training dive in Rhode Island. The intense brain freeze. It was like simultaneously slurping a slushie too fast while hanging out in a meat locker in Siberia during a blizzard. I considered bolting to the surface, and swimming back to the entry and saying, a la Cartman “Screw you guys, I’m going home.” My breathing was rapid. I sank and tried to keep my wits about me. I felt the pinch in my ears. I looked up and realized I’d sunk to about 20 feet and neglected to equalize my ears. In all my focus about the cold, I’d forgotten, and my ears were screaming for me to pop them. I blocked my nose and swallowed a few times to get them to pop, so that they could better respond to the increasing pressure of the water surrounding my ear drums. I focused my attention straight ahead and tried to marvel at the blue light clarity of the water. The rock formations on either side were in perfect focus. I tried to pay attention to their shape. But I was so damn cold. I didn’t see all the caves cut into the rocks. I turned to check on Todd behind me, he was in his glory, checking out the scenery. I paused to have my picture taken where I could touch the plates. I was so damn cold, though. But not so cold that I can't revel in the idea that I was touching North America with my right hand and the Eurasian plate with my left. 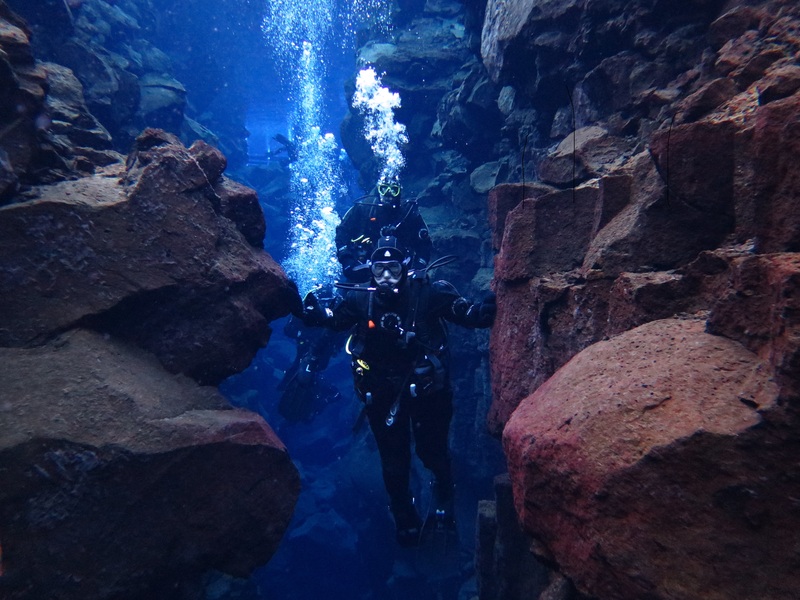 I can see why you would want to do 2 dives at Silfra. One to get over the shock of being so cold. And then the second to actually enjoy what you’re seeing. That’s what I was missing. That second dive where I could actually want to check things out because I understand about the cold already. Below the surface was as desolate as the Icelandic countryside, in its lack of wildlife and lack of plant life. 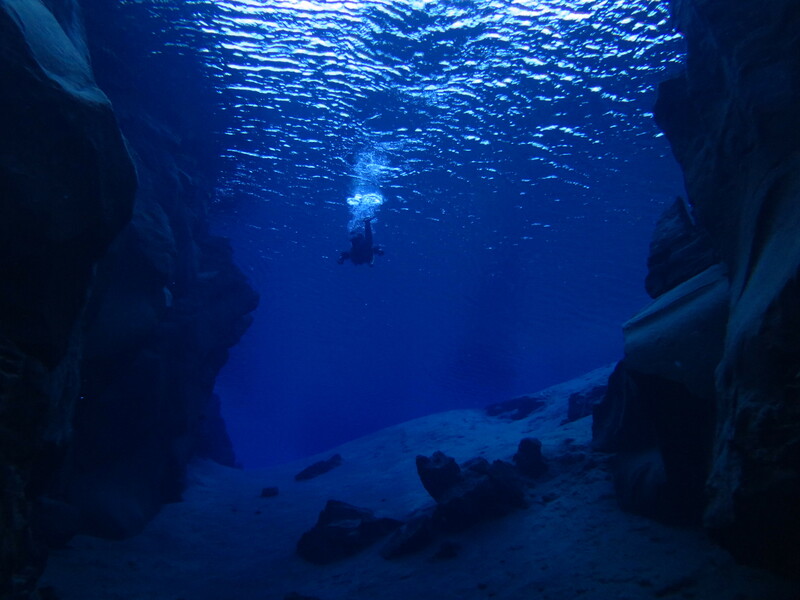 It was simply rock structures in crystal clear water, clear enough that other divers have reported feeling vertigo because there’s no sense of being surrounded by water. It’s that clear. We turned the corner and headed to the exit platform. I saw it and knew I wanted out. I was chilled to the bone, my head ached. But I couldn’t look away from what I was seeing at the same time. The ultimate torture: the collision between extreme discomfort and splendor. I stepped onto the platform, and my fins were taken off my feet. I still had the walk back to the parking lot, that quarter mile or so. 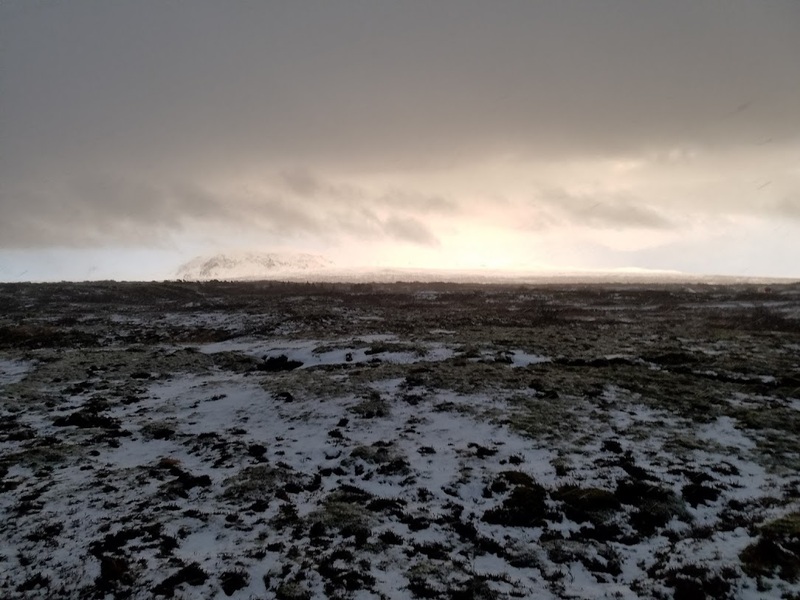 The sun was still out, as much as it can be in the Icelandic winter. From the moment the sunrises, that golden hour before sunset lasts all 4 hours of the day. This is the trail back from the exit. It looks like it goes on forever. It feels that way too. I made the walk back, I was helped out of my gear. And then it gets fuzzy after that for a bit. My dry suit zipper extends across my back from my wrist, up the length of the back of my arm, across my shoulder blades, and then down to the wrist on the other arm. I was unzipped. And then the convulsive shivering happened. My hands were pulled from the suit’s wrist seals, my head pulled from the neck seal. I vaguely remember sitting down and the suit was pulled from my legs. I took the hat from my left foot and jammed it onto my head. Todd’s big fluffy LL Bean jacket materialized around me, and was zipped on. I was lead into a nearby van, the cargo area fitted out with benches down the sides and heat piped in through what looks like a dryer exhaust hose. A cup of epic Icelandic hot chocolate placed into my hands. My jaw vibrated, my teeth chattered, tears sprung to my eyes, and a sob formed in my throat. The other guys from the dive came in, but not Todd. He was gearing himself down after taking care of me. One guy was from Chicago. The other worked in some diplomatic capacity setting up embassies. He came from Arizona via Norway. We talked about the dive, and I began to come to with the conversation. The underwater camera was passed around. I thumbed through the pictures not able to distinguish one dry suit diver from the next. That was the hard part of picking out the pictures from the feed that the dive shop gave us. I thoroughly examined the images looking for clues—a logo on the hoods that Todd and I both wore. Todd’s mask was black, mine was blue. Todd’s dry suit has orange and white writing on the sleeves, my borrowed one didn’t have pockets on the thighs. As we drove back to the hotel, the serious snow began to fall again. We made it back to the hotel, where Todd had the foresight to book us into the spa for hot tub soaking and massages. Rubbed down, blissed out, and bones warmed, we made our way to the hotel restaurant as the snow was falling sideways outside and neither of us had any inclination to battle the cold again. Todd enjoyed his Icelandic lamb birthday dinner served with sun chokes. Who knew that the sun choke, which is the root of a sunflower, is kind of like a carrot and tastes a bit like a potato? Well, the Icelandic people knew because it is their way to use all that surrounds them to sustain themselves. The chefs prepared our desserts by freezing bramble berries with liquid nitrogen, to produce icy crystals of berries garnished around the chocolate mousse. And that was how the love of my life turned 40. Read Day 1: Arrival in Iceland here. Read Day 2: South Coast of Iceland here. Read Day 3: Reykjavik and Fontana here. Read Day 5: Blue Lagoon and Leaving Iceland here.